The first 3 are all sugars, followed by milk, yogurt powder and some probiotics (live microrganisms, like the bacteria in drinks like Yakult and Vitagen). As you can see from the ingredients list, frozen yogurt is basically just ice cream with some yogurt powder thrown in. It's ice cream with probiotics but is the live bacteria in frozen yogurt sufficient to offer benefits to our digestive system? There is substantial evidence that ordinary yogurt with live bacteria helps to overcome lactose intolerance and combats digestive tract infections. 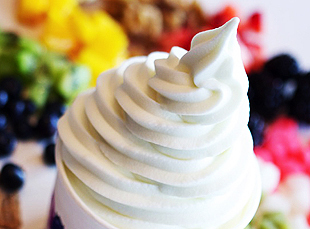 Ordinary yogurt with live bacteria contain hundreds of millions, even billions, of bacteria. The New York Times conducted their own tests on the amount of live bacteria in regular and frozen yogurt and found that the number of bacteria in frozen yogurt is very low. For example, in a non-fat plain Dannon yogurt, there were 2.6 billion bacteria per gram. 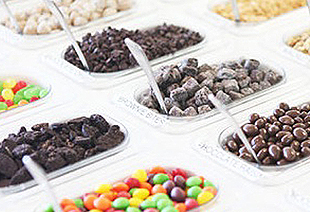 The closest any frozen yogurt came was Haagen-Dazs, with 130 million organisms per gram. The rest tested ranged from the low thousands to tens of millions. A health food the frozen yogurt is not, but what it is, is a great dessert and a delicious alternative to ice cream. It has a lighter texture, lower fat, lower calories and is served in a fun way with your choice of happy-coloured toppings. So if you are not bothered about the minute nutritional details, and you are not thinking that the frozen yogurt will replace the regular yogurt for your supply of healthy bacteria, then we say lets all do the Fro-Yo!